"Un poitrine de poulet avec un interieur base sur la saucisse. Vraiment bon! 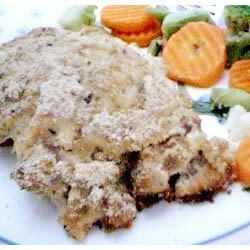 This chicken is excellent served with either a bechamel sauce or a light sauce made of sour cream, milk, Parmesan, and cream cheese, and sprinkled with parsley before serving." In a skillet over medium heat, break apart the sausage and cook until evenly brown. Drain grease. In a bowl, mix sausage with cream cheese, Parmesan cheese, egg yolk, oregano, garlic powder, and Worcestershire sauce. Place equal amounts of the sausage mixture on each chicken breast. Fold breasts tightly over the filling and secure with toothpicks. Arrange in the prepared baking dish. Brush with butter and sprinkle with bread crumbs to coat. Bake 45 minutes in the preheated oven, until chicken juices run clear. See how to make succulent baked chicken with a crispy, corn flake crust. Was an okay recipe, but not worth the effort, for the end product. For this much effort, I'll stick to chicken cordon bleu. C'est magnific- we absolutely loved this dish! The only changes I made were using hot Italian turkey sausage, instead of pork, and 1/3 less fat cream cheese. The recipe is a keeper! Excellent, trasted like something you would get at a five star restaurant. I will make this recipe again and again. Everyone raved! I also used the bechamel sauce I found on this site... WOW! I even impressed myself. I'm glad I tried this recipe. I love stuffed chicken breast recipes. And this one was unique. It was really good.